Prosthetic management of children with congenital lower-limb deficiencies can be a very complex process and is best carried out in special clinics offering comprehensive care for juvenile amputees. 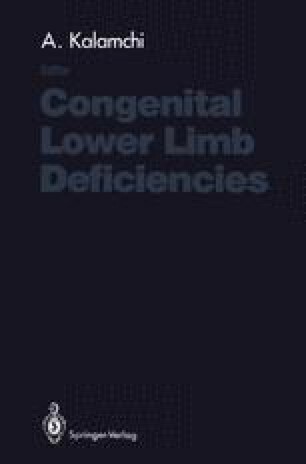 Comprehensive care is usually essential for children with multiple limb deficiencies. Approximately 70% of juvenile amputees have congenital limb deficiencies and most of these are of the lower extremities.13 The problems confronting the orthopaedist and, prosthetist in the child with a congenital lower-limb deficiency include corrective and revision surgery, the effects of growth on the involved extremity, prosthetic fitting and revisions, prosthetic training, extremity function, and psychological adaptation and acceptance. The goals of prosthetic replacement of an extremity include optimum function, comfort, and cosmesis. It is important that functional restoration be compatible, whenever possible, to the non-limb-deficient child of the same age.